Church-sized sacred art and images, Divine Mercy pictures, original Divine Mercy images, and Divine Mercy 'Giclee' canvas art prints, framed art or un-framed art by popular Divine Mercy image artists. 50% Off In Stock, Framed Images - Ship Same Day! In honor of the 100th Anniversary of Fatima, we are offering 50% off all of our products. Select and purchase an image for your church or home today! In stock, framed and unframed, ship same day. New orders ship in 1-5 days. Don't let your parish be without an image. 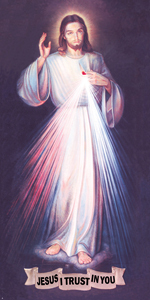 Select and buy a Divine Mercy image for your home or church today! Click on any of the images to enlarge the picture. 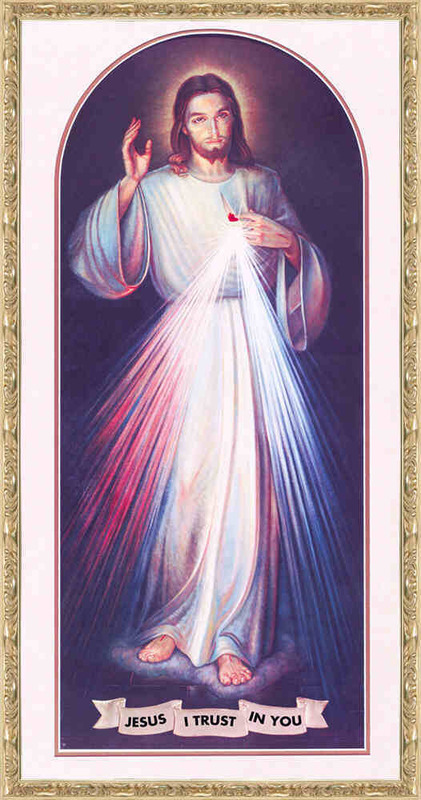 Click here: to place your order online and to see all of the different Divine Mercy art and picture sizes and the prices of these popular, high quality images that we offer as rolled art prints on high quality paper and on special water-resistant canvas, known as 'giclee' canvas art prints. 'Giclee' pronounced as "zhee-klay" is a term first used to describe fine art digital prints on canvas. The word 'giclee' applies to all of our art prints because they are all printed with the same fade resistant, archival (pigment based, long lasting) high quality inks. Our paper and canvas prints are printed with the same inks, and are reproduced, exactly and with intense detail, on the world's most advanced printer. Divine Mercy Canvas Images are also available already framed. Multiple languages are available by special order on most of our images. For further details call us at 1-888-732-0722 or e-mail us at the e-mail address at the bottom of this page. Introducing our new "Cathedral" Divine Mercy images now available printed on canvas or paper! Considered by a Vatican Art Museum expert as the "most beautiful Divine Mercy painting he's ever seen." Not many of us are aware that our current Pope, Benedict XVI has recommended the re-introduction of icons and images into our Churches. To most Catholics this comes as a very welcomed surprise and an answer to many, many prayers. Pope Benedict XVI, at the turn of the millennium, in one of his best known books, �The Spirit of the Liturgy?wrote extensively on the need for sacred art in every Catholic Church. He wrote of the misunderstanding of Vatican II and how the removal and destruction of images, in his own words, �left behind a void, the wretchedness of which we are now experiencing in a truly acute way? He spoke of the �crisis of art?today, being �a symptom of the crisis of man�s very existence? We don�t have to go too far to see the �sense-less?art that is prevalent today. Modern sacred art with its unrealistic and odd-shaped corpuses and statues does nothing to bring to mind anything of the sacred at all if it is not truly life-like. Our churches need to be adorned with sacred art that lifts our souls to a view of our heavenly home, where the saints abide with the Father, Son, and Holy Spirit. Pope Benedict states �lack of images is incompatible? The Pope explained, �The complete absence of images is incompatible with faith in the Incarnation of God. God has acted in history and entered into our �sensible? world, so that it may become transparent to Him. Images of beauty, in which the mystery of the invisible God becomes visible, are an �essential?part of Christian worship? Note here that the Pope said �images of beauty?and not modern art. What is most remarkable in the twenty plus pages that the he dedicated to sacred art in this book, is the prevalence of the description of an image that could only be the Divine Mercy image itself. He not only noted that it was wrong to remove the images and icons, but he went on to explain what the perfect image would have to contain and only the Divine Mercy image could possibly meet all of his criteria. I would challenge you to pick-up a copy of this book, but fasten your seat belt! As you read Part Three, Art and Liturgy, The Question of Images, keep in mind all the details of the Divine Mercy image. His thorough explanation of the essentials of sacred art, that is ordered to divine worship, could only apply to an image that has all the aspects of the Divine Mercy image that Jesus requested to be painted. His brilliant and methodical explanation of sacred art is truly a masterpiece that everyone should read. Re-reading only takes you deeper into the intellect, which this Pope has, probably second to none, concerning liturgical worship throughout the ages. The more you read, the more you come to understand the importance and significance of having the Divine Mercy image in every single Catholic Church. Not only is the Divine Mercy image appropriate and essential for everyday liturgy, as the Pope has declared, but it is also most appropriate for a Feast of Mercy. On Mercy Sunday, all of the readings, starting from the Opening Prayer, direct us to focus on the redeeming �blood? the washing away of sins in �water? a new birth in the Spirit, the institution of confession, and the importance of trusting in Jesus. The Pope said �On liturgical feasts the deeds of God in the past are made present. The feasts are a participation in God�s action in time, and the images themselves, as remembrance in visible form, are involved in the liturgical re-presentation. ?He spoke of the images as being a �path of hope, into which the images draw us, giving us the assurance of the world to come, of the final coming of Christ? 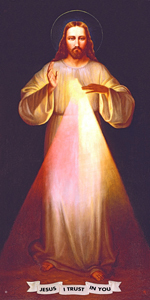 The Divine Mercy image is truly a �path of hope?which will lead us safely to the �final coming of Christ? Jesus gave us this image specifically to give us hope and to give us a constant re-assurance that will lead us safely home to His coming. The words �Jesus, I trust in You?have been a great comfort to many people, especially in the parishes that have permanently installed images in their liturgical settings. Benedict wrote �The icon is intended to draw us onto an inner path, the eastward path, toward the Christ who is to return. Its dynamism is �identical?with the dynamism of the liturgy as a whole?In the liturgy the curtain between heaven and earth is torn open, and we are taken up into a liturgy that spans the whole cosmos. ?The Divine Mercy image portrays Christ coming to us from Heaven and opening up that curtain and bestowing upon us His inexhaustible grace and mercy. It is interesting to note that the Pope said that the images �have a reference to the sacraments, and above all, to Baptism and the Eucharist, and, in pointing to the sacraments, they are contained within them?they are essentially connected with what happens in the liturgy? The Divine Mercy image is this perfect depiction. Jesus told us that the two rays in the Divine Mercy image denote the Blood (the Eucharist) which is the life of souls, and the Water (Baptism) that makes souls righteous. Jesus also indicated that we would be able to receive graces from these images, and why not, if the sacraments themselves are contained within them? The Pope continued to explain that �the center of the icon of Christ is the Paschal Mystery: Christ is presented as the Crucified, the risen Lord, the One who will come again and who here and now hiddenly reigns over all. Every image of Christ must contain these three essential aspects of the mystery of Christ and, in this sense, must be an image of Easter? The Divine Mercy image has all these three! Recall that St. Thomas, the doubter, was not there on that first Easter Sunday, but was actually there on that �Second Sunday of Easter? the very first Divine Mercy Sunday. That entire scenario was intended to get humanity to trust in Jesus without seeing. Now we can see why Jesus insisted that the Divine Mercy image, with the words �Jesus, I trust in You?be in view and venerated in our churches on that day. 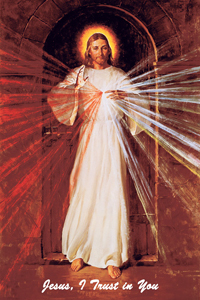 The Divine Mercy image portrays, not only the sacraments of Baptism and the Eucharist, that Benedict XVI indicated as being essential, but as the Venerable Pope John Paul II indicated in one of his Divine Mercy Sunday homilies (2001), it also portrays, in the clear or pale light ray representing the water, the giving of the Holy Spirit which is present in all the other sacraments of the Catholic Church. It is very clear that our Holy Father wrote this book with the intention of pouring out his heart to all of us, so that we might bring life and hope back into the liturgy. His many years as one of the Church�s foremost theologians and as the Prefect of the Congregation for the Doctrine of the Faith, has earned him everyone�s respect. It would be of great benefit for everyone to read this book, especially the clergy. His message of hope, which has become his hallmark, was very prevalent in this work, which was written just five years before his election to the Papal office. He often mentioned the word �hope?and associated it with the Second Coming of Christ. Indeed, this is our hope, and this image of the Divine Mercy was designed by our God, to bring us precisely this hope, and trust, as we grow ever closer to that long-awaited, and very much needed, Second Coming of Christ. The Divine Mercy image perfectly fits every single fundamental principle and indentifying element that Pope Benedict XVI has so painstakingly described. Only by reading this masterful work will we come to understand the depth of the Pope�s insight and the urgent need to re-invigorate our churches with sacred art that is ordered to the liturgy, not just for Mercy Sunday, but for every liturgy, of which no other image could represent so precisely as the Divine Mercy image itself. Is it any wonder, why his predecessor, Pope John Paul II worked so hard to make us all understand how important Divine Mercy is? There is no doubt that the Holy Spirit was working through our Church and the Vicar of Christ to bring about this path of hope. The establishment of Divine Mercy Sunday was a sign from Heaven that now is the time for mercy. We must take advantage today, while there is time. Every parish should have an image of the Divine Mercy, to not only prepare the world for the Second Coming of Jesus, but to bring peace, guidance and prosperity to the Church in the tough economic times that we are living in. The Church has given us this Feast of Mercy, as Jesus has requested and we must not falter in any way to fully carry out the will of the Father in insuring that all souls be saved. We are eager to fulfill Our Lord�s request to have the Image of Divine Mercy venerated throughout the world, not only on the feast, but every day. 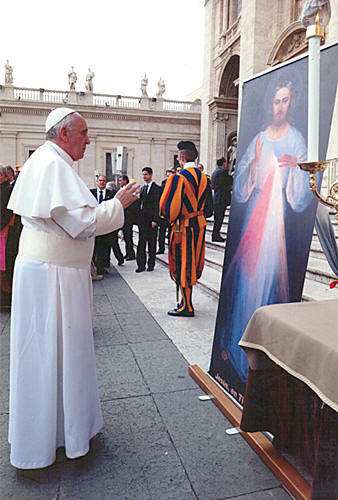 It is very clearly stated in the diary of Saint Faustina (Divine Mercy in My Soul) that Our Lord Jesus wants His Image of The Divine Mercy to be displayed in public; He said ?u>I desire that this image be displayed in public on the first Sunday after Easter. That Sunday is the Feast of Mercy?/span> (Diary entry 88). Saint Faustina also recorded these words of Jesus: �Yes, the first Sunday after Easter is the Feast of Mercy?and I demand the worship of My mercy through the veneration of the (Divine Mercy) image which is painted? (742) After the original image was painted, Fr. Sopocko placed the image in the hallway of the convent and Jesus instructed,?Tell the confessor that the image is to be on view in the church and not within the enclosure of the convent that it�s in. By means of this image I shall be granting many graces to souls; so let every soul have access to it?/span> (570). There have been many miracles attributed to having the Divine Mercy image enthroned in a particular place, such as having the image in a home that was spared destruction in a war, or having the image in a shrine dedicated to the Divine Mercy. Every home, school, and church building should have a Divine Mercy image in it for protection. As we get closer to the Second Coming of Jesus this will become all the more clearly evident. The Divine Mercy image was given to us by our Lord Jesus Himself for many reasons. As time marches on we can see a greater interest in the Divine Mercy image. If it is true that a picture is worth a thousand words, then the Divine Mercy image must be worth untold millions. The Divine Mercy image is not only used to aid in the celebration of Divine Mercy Sunday, with its rays signifying the sacraments, but the image is also used to bring consolation to souls. In churches with candle shrines, the Divine Mercy shrine is usually, by far, the most popular. People light vigil candles under the Divine Mercy image for many reasons including the passing of family members and friends or for those that are in need of prayer, or perhaps for a sickness or for a soul�s salvation. Jesus surely knew what He was doing when He gave us His Divine Mercy image. We are the Apostles of Divine Mercy located in Port St. Lucie, Florida, USA. We started our ministry in 1997 to help parishes to celebrate the Feast of Divine Mercy because there was such a great need. We also started printing high quality life-sized Divine Mercy images on paper and canvas because there was such a great need for quality life-sized Divine Mercy images that would be large enough for use in all of our churches and sanctuaries from Chapels and Churches to very large Cathedrals. We have shipped Divine Mercy images framed and unframed in many parts of the world and we want everyone to know The Divine Mercy. We offer the best quality images and pictures. 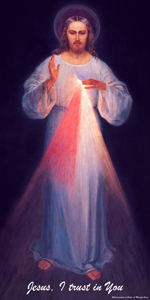 All of our Divine Mercy images are available on the best �Fine Art? water-resistant canvas to best simulate the original Divine Mercy image paintings. They are also available printed on the very best quality paper and with a glossy lamination or on durable vinyl that has a nice texture. Call us for other options. 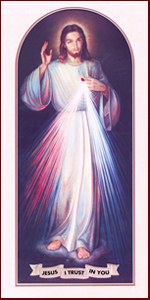 Let us print the perfect Divine Mercy image for you. We print in our own facility and also utilize other print shops that can print on any material and we can also print in many different and multiple languages. So if you are looking for a special Divine Mercy image up to life-size and larger, we can print it for you. Our other website: www.DivineMercySunday.com provides downloadable bulletin inserts, homily ideas, prayers and suggestions for celebrating Divine Mercy Sunday including a special prayer for solemnly blessing the images of The Divine Mercy. We also have a �Knights of Mercy?program to get the Knights of Columbus involved in your area to help your parish to obtain a Divine Mercy image and to offer to process with the images on Divine Mercy Sunday. If you want to help Jesus to save souls by using Divine Mercy Sunday as a great evangelization tool, then please go to our website and ask to become one of our Apostles of Divine Mercy. We are also available for presentations, conferences, talks, and seminars for priests, seminarians, and for parishes. We travel with one of the largest displays of framed canvas Divine Mercy Images to these events. Where are the Divine Mercy images going? 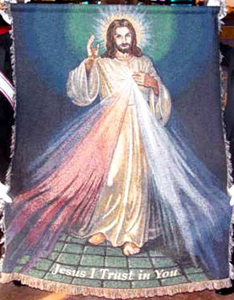 If the Divine Mercy image is going into a church, the pastor should be the one to select the image. The Divine Mercy images come in 1 foot increments: 3?4?5?6?7?8?9?10?11?12��. The 3 foot images we consider a home size, the 4 foot images for chapels, the 5?to 8?images for small to medium churches, and the 9?to 12?images for large churches and cathedrals. A life-sized image would have to be almost 8?in length for the body of Jesus to look about six feet tall. The larger Divine Mercy images look more realistic and the larger images have a tendency to draw much more admiration. To get people to venerate the images and to be able to see the printed words, Jesus, I trust in You, from a distance, always obtain the largest Divine Mercy image possible that can be fitted in the chosen area. 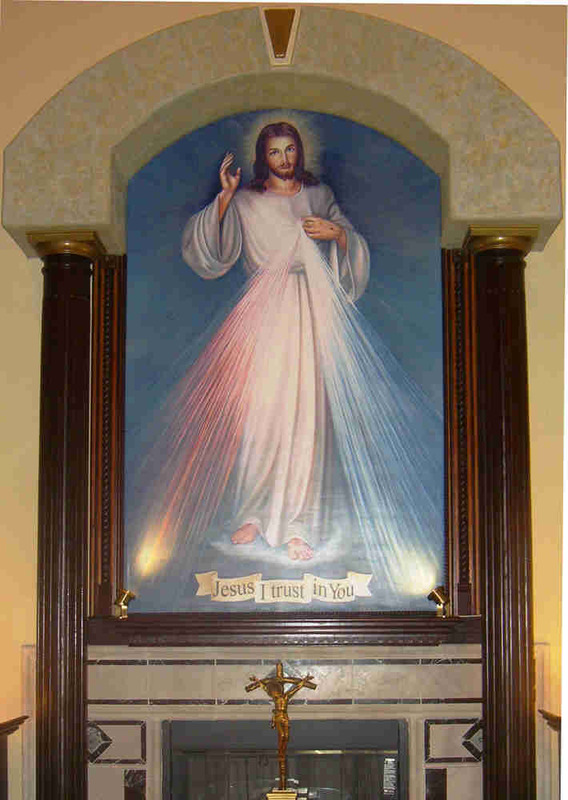 If possible, place the Divine Mercy image high enough so that the words are at eye level. The Divine Mercy images always look better when they are set high so that the image's rays are coming down upon us as they did to St. Faustina when Jesus appeared to her. What type of material? Most churches will want a canvas Divine Mercy image. They are beautiful and they look like the original images. We print on the best water-resistant canvas available. If the Divine Mercy image is to be placed where people may reach or touch it, you will want to protect the image with a non-glare glass. Other Divine Mercy image options are either glossy laminated paper prints that don't need protection with glass or images printed on heavy duty paper that can be protected with glass. Often times glare may be a challenge with glossy images. Non-glare glass works well to stop some glare from lights, but it does not stop all of the glare. Bare canvas is always the best choice for the images. We print on materials that can be rolled and placed in a shipping tube. Most of our Divine Mercy image prints are also available on a very durable banner vinyl that can be used indoor or outdoors for many years. Which Divine Mercy image? This is probably the most frequently asked question about Divine Mercy images. Jesus made it quite clear to us through Saint Faustina that it really doesn�t matter which Divine Mercy images are used. After many unsuccessful attempts by the original artist to reproduce the portrait of Jesus, St. Faustina cried to Jesus truly present in the Tabernacle and He quickly consoled her �The greatness of this image lies not in the beauty of the color or the brush, but in my grace? (Diary 313) Jesus, in His great wisdom, knew of the many different types of Divine Mercy images that would be painted through the years. It is not any particular Divine Mercy portrait, but it is the graces that emanate from the Divine Mercy images that are most important. Let your pastor decide what particular Divine Mercy image he would like before a purchase is made. We have most images in stock and can print a special portrait or any image very quickly. Framing the Divine Mercy images. All of our Divine Mercy images are also available unframed to accommodate those that would like to frame their own images. There are many options for framing the Divine Mercy images. All of the images can be mounted to a backing board or to very smooth finished plywood and the canvas images can also be stretched on standard stretcher bars and then placed into frames. There are many same-day frame shops that can usually frame images within a day or so. We offer framing on all of our Divine Mercy images. We offer specials on in stock framed images from time to time, including life-sized images. Call us about these images at 1-888-732-0722. Where to place the images? If the image is going into a church, the pastor should decide the best placement. It is interesting to note that Pope Benedict XVI, in his last book before becoming our pope, (The Spirit of the Liturgy), spoke of the necessity of using images and icons to assist in the celebration of mass. In it, he thoroughly explained what the most perfect image would have to be like. He perfectly described the Divine Mercy images as having every important detail including portraying: the sacraments (the ray of the water denoting the giving of the Holy Spirit in Baptism, Confession, and Confirmation) (the red ray of blood denoting the life-blood of the Catholic Church, Holy Communion); a message of hope (in the words, Jesus, I trust in You); the Crucifixion wounds; the Risen Christ; and finally drawing us to the Second Coming of Jesus Christ which is the central message of the Divine Mercy devotion. Shipping the Divine Mercy images. Most of our unframed Divine Mercy images are shipped the next day by UPS Ground, Fedex, or by DSL and USPS mail if going outside the USA. We ship images world-wide usually as an unframed print because of the cost of crating and shipping large framed images. We can usually ship your images overnight if you call before 3pm on weekdays. Large framed life-size Divine Mercy images are usually sent by freight carriers in custom made crates. You can see our shipping rates for the US and Canada for Framed Canvas Divine Mercy Images here. 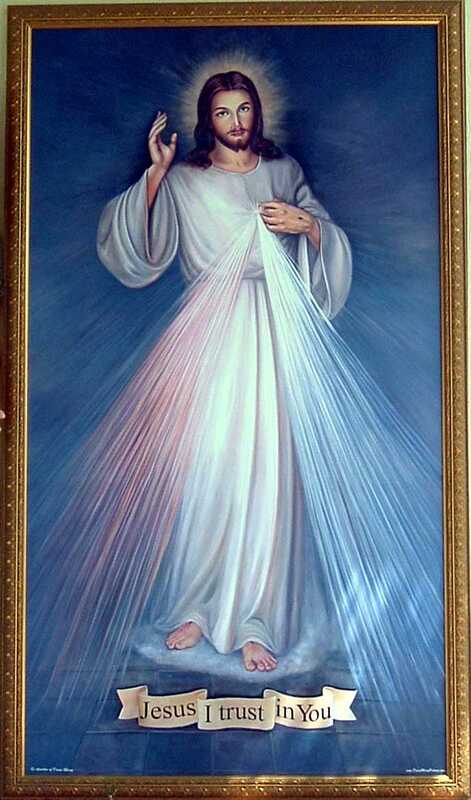 I just wanted to thank you for the beautiful Divine Mercy image. It arrived on Easter Monday, just in time for me to get a big frame for it. I can't wait to have it blessed on Divine Mercy Sunday and to "enthrone" it ? I can't get over how absolutely captivating it is. I had a hard time finding it, and when I did, I wasn't sure if I would like it as much as renditions of it, but it is incredibly more beautiful than any other I have ever seen. I'm convinced this is what Jesus wanted--the eyes are completely captivating, and there is just a hint of a smile on His face. Absolutely beautiful! Thank you for sending it in such wonderful condition! What an awesome service from you! Thank you very much indeed! I received the most beautiful image at my office on Wednesday March 14th, 9.00 am Fiji Time. I couldn't wait to take it down to the parish priest and spiritual advisor. The beautiful image was opened in the presence Father, our parish chairman and one of the hardworking members of our Divine mercy community here at our parish. Just absolutely magnificent! The Image was immediately taken down to one of the leading studios here in Suva for framing - gold framing. I have just return from the studio?and it's just awesomely beautiful and graceful?our parish priest and we have really fallen in love with the majestically tall image and we wonder if you would have another one or two of the same kind and size�then if you would keep two for us. Everything worked out perfectly? the Image is so mesmerizing. The more we gaze with veneration at the image, the more we feel His presence. This Image is amazing, we pray the rosary every night and the Chaplet of Jesus every day. At every time we prayed, we felt more closer to Jesus. Every guest that has come to our house has gasped and was amazed with the image. We had one guest that actually cried when she walked in the room. We would like to thank you very much from the bottom of our hearts for making this happen just right before Christmas. I feel this transaction is what God wanted, it only took exactly one week from time we ordered to the time we had it up and blessed. I can go on and on of how much we love the image, but? Once again, Thank you very much for everything, you've brought to our family a bright, warm and meaningful Christmas this year. Have a wonderful Christmas and God bless you and your family. The image of the Divine Mercy just arrived. It is, as promised gorgeous and compelling. I am so grateful... K. B. Whether you are looking for one life-sized Divine Mercy image or many images, pictures, portraits, or any Divine Mercy painting or icon, we can accommodate your needs. 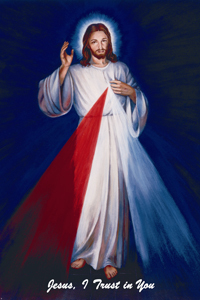 We can re-paint any Divine Mercy image with clear paint on top of our Divine Mercy canvas prints, called "hand embellishing" or we can custom paint a new Divine Mercy Image of your choice or one to match one of the original Divine Mercy images. We can also modify the colors of the Divine Mercy Images with our computer program. We can change the background color on the images or change the intensity of the colors of the rays or of the entire image. We want you to have the Divine Mercy image that you and others will love and venerate. Some refer to Divine Mercy images as a Divine Mercy portrait, Divine Mercy painting, Divine Mercy picture, or a Divine Mercy print. Jesus always referred to the portrait as an image. The Divine Mercy image could also be called an icon of The Divine Mercy, because the image portrays many symbolic elements that are found in icons. The word "icon" comes from the Greek word "eikon" which translates to the word "image". Jesus said "Paint an image according to the pattern that you see" (from the Diary entry # 47). So essentially, Jesus was asking for a painted icon. We can print whatever image you desire up to life-size and beyond. We can print all of the Divine Mercy images on any material and we can print all of the Divine Mercy images in multiple languages. 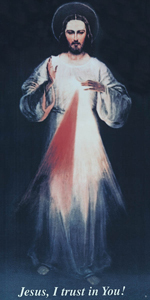 Let us print the very best Divine Mercy image for you or your church. We are a not-for-profit Roman Catholic Ministry serving the Catholic Church. Support for the ministry comes from the sale of Divine Mercy Images, icons and pictures. Please help us to help Jesus save poor souls on Mercy Sunday.